Clarke, New England's exclusive distributor of Sub-Zero and Wolf appliances, has achieved its decade-long dream of becoming a solar-powered company. The massive rooftop solar array puts Clarke at Net Zero electrical energy consumption for its 106,500 s/f headquarters complex. Solar energy now powers all operations for the company's offices, high-performance appliance showroom, culinary center, television studio and warehouse. A total of 2,304 200-watt solar panels now power the Clarke complex. "This is a great way to celebrate our 20th anniversary in business," said Tom Clarke, CEO. "We have always looked toward the future and made every decision based on business excellence, customer service and innovation. There's no better way to encourage homeowners to explore solar power than install it to power 15 kitchens at once in our showroom. Every Sub-Zero and Wolf is now solar powered at Clarke." The Clarke complex includes The Clarke Culinary Center, where local and national chefs share their cooking secrets with homeowners in weekly classes. Clarke general manager Sean Clarke, along with Clarke director of finance and IT Chris Parker, spearheaded the project, diligently researching ROI, federal and state grants, American-made products and solar resources. "We believe this project is a great example of a privately owned family business in Massachusetts doing what is good for the environment, the community and the country," said Sean Clarke. The Clarke solar project ranks in the top five rooftop installations (in terms of kilowatts) in Mass. and was collaboration between Clarke and solar installation company Beaumont Solar. According to Parker, Clarke will generate 94% of its electrical energy through solar power generated by the solar panels. In addition, Clarke has taken serious steps to reduce its energy consumption by 6% through internal efficiencies. The combination of these activities has resulted in Net Zero electrical energy consumption and a savings of more than $77,000 each year. The Clarke project will avoid the emissions equivalent to 35,052 gallons of gas per year or the electricity used by 37.9 average American homes. 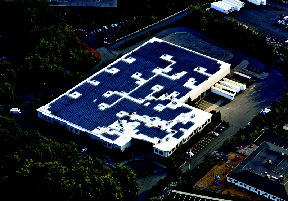 The Clarke solar installation launched at the end of April, with conversion of the building's original ballasted roof to a "cool roof" surface, which required removal of all embedded stones and installation of a more energy efficient white roof surface to reflect the sunlight onto the entire cylindrical surface of the solar panels, making the roof part of the specified energy property. "We chose Beaumont Solar Co. as our installation partner on the project," said Sean Clarke. "From the first time we met with Beaumont president and CEO Phillip Cavallo, we knew his company had the same philosophy that we did. They are one of the top three solar installers in the Commonwealth and performed the entire installation process using their own internal company employees. Together we hope to inspire other businesses and homeowners to adopt alternative energy sources."